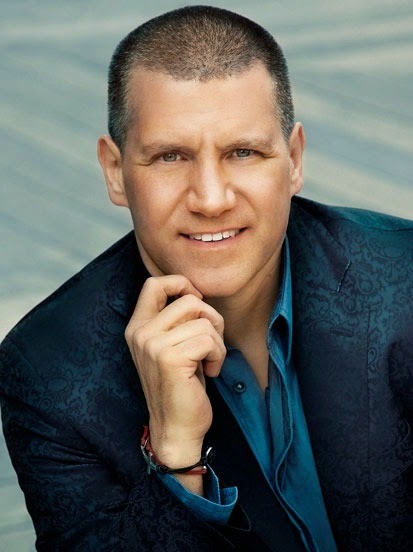 With nearly three decades in the fragrance industry, creating fragrances for the likes of Elizabeth Arden, Estée Lauder, Elizabeth Taylor, and Karl Lagerfeld, Raymond Matts has finally launched his own signature collection -- Raymond Matts Aura de Parfum Fragrance Collection. And within this non-traditional, seven-piece collection, Matts alters the way in which we think of fragrance with an unchartered approach to the artistic design of perfume. Do not seek the tradition of themes and notes, because these are not structural components within this distinctive unisex collection. Team TME has a special passion for fragrance. There isn’t a member here who hasn’t taken the time to educate herself, on some level, beyond the spritz of a lovely scent. Fragrance is so deeply tied to emotions and memories. For one staffer, fragrance is a reminder of her father who always brought her parfum from his travels and for another; it is reliving the whirlwind global romance that led her to her partner. And because of our passion for fragrance, we become slightly obsessed with finding out about the perfumery and person behind the fragrance. The question is always, “Who is behind the scent”? We were fascinated to learn that Raymond Matts began his career behind the counter at Aramis in New York City. Apparently as fascinated with fragrance as we are, Matts joined the internationally renowned fragrance houses of Firmenich and later IFF. He also holds a B.A. in Cosmetics/Fragrance Marketing from New York’s Fashion Institute of Technology. From counter to creator makes us slightly envious of this esteemed perfumier. What sets The Raymond Matts Aura de Parfum Fragrance Collection apart is Matts’ avant-garde approach to fragrance design. He doesn’t design for the past or present … he puts a new twist on fragrance development by blending the fragrances within the collection to reflect futuristic abstract scents. His design approach to this collection was to place an emphasis on building the scent with textured and harmonious blends of essences that suggest particular notes and moods. 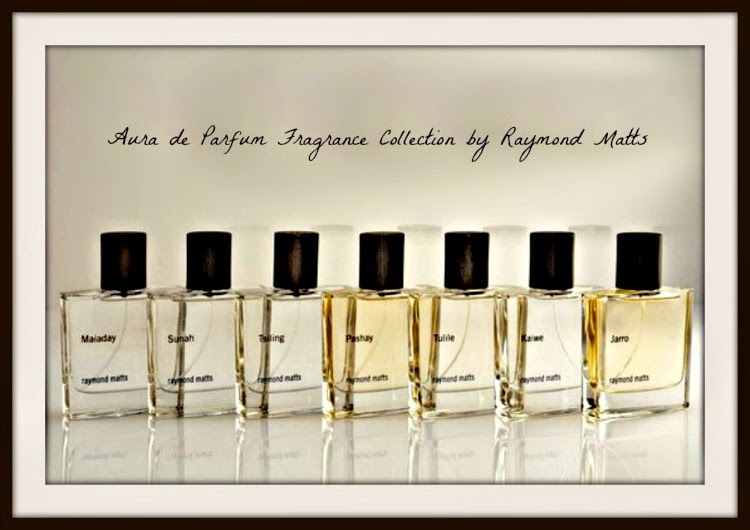 The Raymond Matts Aura de Parfum Fragrance Collection truly is art! Maiaday (My*a*day) - This abstract floral is inspired by linden trees in bloom on a soft summer day; a tactile bouquet of airy floralcy. At first bloom there is a luminous brightness from a blend of citrus and watery green tones, combined with the fresh qualities of muguet and lilac. The velvety depth of a flower petal is achieved through. many green floral notes, all softened with a hint of saffron, vanilla, and soft woods. Sunah (Soo*na) - A hand traces the sinuous line of beauty… sheets infused with the softness of her scent. Never a distant memory! The tactile beauty of a flower is created from dew-laden muguet mingling with the green of mimosa and accents of apple to create the aroma of a wafting flower. The mysterious warmth of saffron combined with soft woods reveals a signature of sensual softness. Pashay (Pa*shay) - A fragrance of contrasts, Pashay was inspired by sultry days; a sun-kissed Mediterranean shoulder passing by on a Fifth Avenue bus. An edgy opening with a golden hue of freshness from a citrus blend balanced with the green watery nuance of William Pear. Marine notes of seaweed extract and kalamata olives enhance the beauty of Narcissus absolute, creating a daffodil impression. The sensuous depth is warmed with sandalwood and smoky traces of guaiac wood. Tsiling (Tis*ling) - Changing the traditions of perfumery and inspired by pop art, a plastic flower with nature’s scent is born… unexpected warmth will playfully appear. A spray of crisp Asian pear introduces a natural wet green aura, while orris and the freshness of honeysuckle create a plastic floral impression. A cozy creamy sensation saunters forward as milk, rice, and a pinch of patchouli bring a hint of comfort. Tulile (Too*leel) - A refreshing softer side to masculinity with an unexpected playfulness and sensual warmth. Deceptive with a pleasing alluring nuzzling quality. The initial predictability is soon replaced with intrigue; a watery-green impression is married to frosty crisp notes with a citrus twist. The sensation of dew laden muguet petals creates the illusion of a lingering citrus freshness. Polywood and ambrox provide an understated deep softness and intrigue. Kaiwe (Ky*way) - Inspired by the lingering scent of a shower aftermath to walking on a rainforest trail of green adventures. The freshness of aldehydes married with an ozonic citrus blend meets a cooling eucalyptus and a hint of mint. An undefined floral heart is brightened with resinous green notes: juniper, a touch of rum, warmed with milk and ambrox. A relaxing casual blend distinctively his. Jarro (Yar*row) - Humid vapors rise up inside a private villa on an exclusive tropical island. A daring unusual blend of sisal and the masculine spice of lilies emanates in the air. Sun-kissed citrus notes play within a green melon accord, which intermingle with the fresh volatile notes of labdanum and a watery green nuance of un-ripened hazelnuts. Orris provides richness, softening the masculine spice of lilies and humid texture of hemp. An enigmatic depth of exotic woods, wrapped with touches of tobacco, warm this fragrance. In conjunction with a departure from traditional perfumery, Matts’ purposefully created a scent “wardrobe,” versus one signature scent, allowing a man or a woman to choose the fragrance they connect with depending on the day, occasion or mood. Capturing the rhythm of each scent, each fragrance smells the way it sounds, therefore each Aura de Parfum name is all its own. Each name defines the corresponding fragrance, resonating with an alluring quality. From dreamy and elegant to sultry and adventurous, each fragrance evokes a particular emotion, which is what fragrance should do for the wearer. The Raymond Matts Aura de Parfum Fragrance Collection ($200 each) is available online at Raymond Matts and select Nordstrom locations.